All data files have to be in tab delimited ascii format and missing values should be labeled "NA". Example files are available in the Download and Installation section. In the following we will describe the required data formats for the different data types. The names of the required columns can deviate from that in the description. In this case the user has to change the naming of the required columns in the "Loading Settings" menu. SEURAT provides no preprocessing tools, gene expression data should be normalized and preprocessed beforehand. It is mandatory that the first column contains the gene IDs. The following columns should be named according to the sample IDs and contains the gene expression values of the respective samples. The first column should contain the sample IDs and these IDs should have the same format as in the gene expression file. Additional columns can contain any type of continous or categorical variable with the name of the variable in the first row. The first column has to contain the geneIDs and the gene names must be the same as the gene names in the gene expression file. In case of pathway informations where each gene can belong to different pathways, the entries of pathway variables have to be lists of comma delimited strings, e.g. : "cell_signaling, immunology, metastasis" or for GO-terms: "molecular function|ATP binding|IEA|GO:0005524|GOA/IPI, biological process|defense response to pathogen|IEA|GO:0042829|GOA/IPI, cellular component|nucleus|IEA|GO:0005634" The name of a pathway variable has to begin with "#" as the first character. If the data set contains URLs (e.g. linking to cross-references like PubMed), the name of the respective column has to begin with a "@" symbol. In order to associate the gene expression data with the array CGH data the gene annotation file is needed. In addition the annotation file has to have a column called "ChromosomeNumber" containing the number of the chromosome and a column called "NucleotidePosition" containing the starting position of the ORF of the gene. Additional columns can contain any type of continuous or categorical variable with the variable names in the first row. The array CGH data should have been normalized and preprocessed. A segmentation algorithm should be applied to estimate cytogenetic gains and losses. We used the R package GLAD to preprocess our example data file. The first column contains the cloneIDs of the CGH clones. To link the states of the clones with the samples, a column with the name "samplename.States" is needed for each sample. These columns contain the result of the segmentation algorithm and the entries are "-1","0" or "1", which correspond to a cytogenetic loss, no change or gain. Like the array CGH data also the SNP array data need to be preprocessed. To normalize Affymetrix SNP chips (Genome-Wide Human SNP Arrays 6.0), we used the R package aroma.affymetrix. A detailed R script descriping the preprocessing of Affymerix exon arrays (GeneChip Human Exon 1.0 ST Arrays) and SNP chips is available in the download section. The first column of the snp file contains the SNPIDs. To link the states of the SNPs with the samples, a column with the name "samplename.States" is needed for each sample. These columns contain the result of the segmentation algorithm and the entries are "-1","0" or "1", which correspond to a cytogenetic loss, no change or gain. 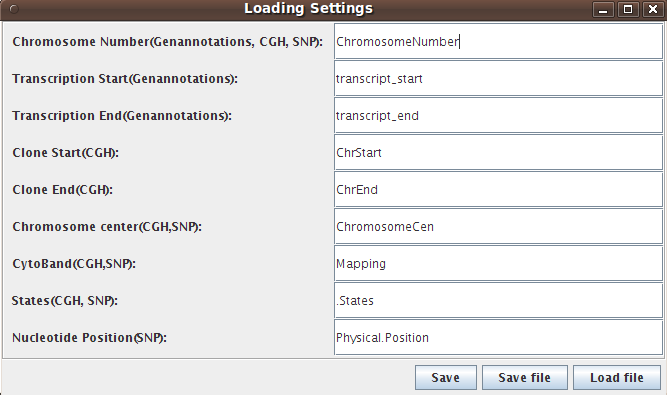 To link the SNP data with the gene expression data, the following columns are needed: "ChromosomeNumber", "Physical.position", "ChromosomeCen" and "Mapping".